A band that can create epic, churning technical metal juggernauts better than MASTODON, and make them seethe and creak like the most apocalyptic NEUROSIS endtime visions, with the scorched-earth battery of KEELHAUL at their most ferally fucked up… that's the promise made by INTRONAUT's debut EP, "Null", earlier this year. And it's a promise more than fulfilled by "Void", their debut full-length album. If there's a better record released this year, mortals probably wouldn't survive hearing it. Don't let the short track listing fool you — this is about 45 minutes of damaging noise. The guitars are massive, shifting walls, huge chiming chords cascading down and creating a bleak, sodden atmosphere. Bass lines wander in and out of whatever sonic space they can find, often carrying warped melodies through the squall of the guitars and the hoarse, bellowed vocals. The whole thing buckles and shifts, slithering between time signatures and throwing in jazzy interludes, airy quiet parts, and punishing primal roars that peel the paint off any fancy notions of "prog" that might creep into the discussion. If you're worried that "Void" won't beat you to a pulp, skip right to the last track, "Rise to Midden" — you'd be hard-pressed to find a more tightly-wound concentration of rage and malevolent energy in one song. Even the quiet parts give off an air of taut tension, a breathing space like the eye of a hurricane, where more and greater violence is inevitable. The whole thing ties together in this cinematic sweep, a transcendental listening experience that demands attention and focus — this isn't background music! The whole of "Void" should be listened to that way, from start to finish, the ebb and flow of each track into another as important as the songs themselves, the empty spaces as carefully crafted as the loudest bursts of guitar squall. 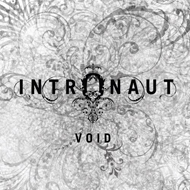 INTRONAUT are hard to describe, or to categorize — their wall-of-sound metal is the soundtrack to planets colliding and uncharted journeys into one's own psyche. "Void" is more important than a lot of more hotly-tipped albums coming out this year, and it's certain to put all of them to shame. INTRONAUT is the future.